This could apply to other cars in Fiat Chrysler group. Find the belt on the left of the engine. You can take a picture of the routing. Identify the belt tensioner by pulling on the belt and seeing which pulley yields. In my car it is the center pulley. It has a 13mm hex bolt on it. Hold it while you pull on the belt to see which way it turns as it yields. In my car it turns clockwise. I think there is a hole to lock the loosened tensioner in place, but I did not even attempt it due to difficult access. Use a ratchet and turn the tensioner with left hand and use the right hand to slide the belt from/onto the bottom pulley. It will be easier to put on a belt if it is longer rather than shorter. 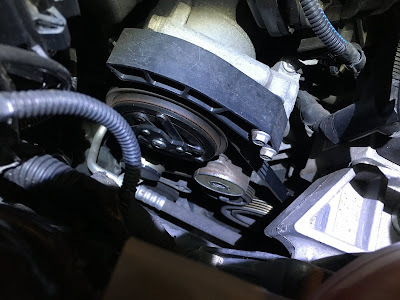 I got myself a rather short replacement belt and it seemed I had to turn the tensioner to the limit to put it on. Tools used: a 1/2" ratchet with 24cm arm, a 13mm hex socket, head lamp. Etwow scooters are sold under other brands too, including Frugal, SXT and UrbanGlide. I am not actually sure ETWOW is the original manufacturer or just another brand and scooters are manufactured by a yet another company. I got myself a used one, and it came with several issues, one of which was a stuck front suspension. But first things first. This scooter has no air in tires, instead it relies on a spring front and rear suspension for comfort. In order to actually benefit from it you need to regulate it to your weight so that there is a sag when you mount it. The rear one is very easy, just loosen the screw tightening the spring. The front one has such a screw compressing the spring too, but the access is not easy. You need to detach the wheel and the steer pipe and then you need a special tool, a deep socket wrench size 10 if I remember correctly. Car mechanics usually have those if you can't find it in a store. See the photo below of how the scooter looks like being ready to loosen the tightening screw. 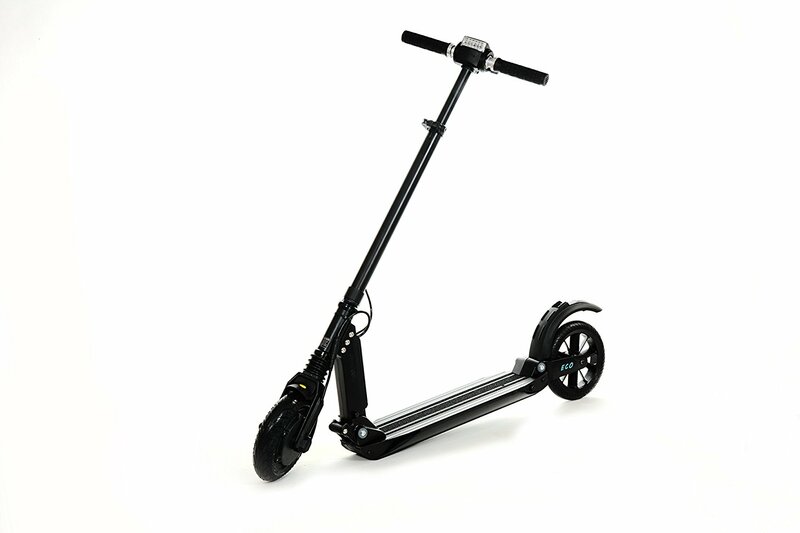 Here is a link to the service manual for the scooter. You need to block the screw from the bottom with a 10 hex key, and turn from the top with the socket wrench. That socket wrench needs to be deep because there are four screw nuts on top of each other. For my electric scooter that adjusting was not enough though. The suspension was stuck because the plastic hexagonal bed was too tight for the metal rod that was moving in it. A friendly mechanic polished the metal rod by hand using some sort of metal grinding tool (no machines involved) just to make it a bit thinner so that it would move freely inside the plastic bed. Even with the suspension working the ride is not as comfortable as on a full size bike with no suspension. I don't think it is the superiority of air tires over a spring suspension, but rather a function of wheel size. Disclaimer: Before all this work, I contacted etwow for some information on how to adjust the front suspension and the person I talked to said the front suspension is not adjustable and that the tightening screw is holding the spring in place and loosening is not advised. I chose to ignore him and adjusted it anyway. It works. This post is about replacing a hatch button badge that looks worn, but the button works fine. It seems to be a common issue for the model brought on by the way they are attached; I explain below. You pry the aluminum logo off the button with a knife - start with stabbing it near the edge toward the center. The logo badge is attached to the plastic button underneath with an adhesive. It is a 3 millimeter thick layer of soft adhesive that is only present in the center of the button. The adhesive not covering the whole button is most likely the reason for the wear, as the damage happens near the edges where there is no adhesive to support button pressing. I attached a replacement badge using silicone just because I had some and it seems to have a similar consistency to the original adhesive and would be similarly easy to detach should I ever need to. I tried to distribute the silicone on the whole button, not just the middle, to prevent deformation on pressing. Silicone seems to hold it fine, haven't lost it yet. As to the logo badge, you needed a 75mm wide one, the first one I bought, a 74mm one, did not fit. The badge is the same for the front and back.